Just got your hands on the brand new Samsung Galaxy S8 but freaking out with some glitches and errors? Here’s a definitive guide to what are the most common problems on Samsung Galaxy S8 and how you can fix them with ease. Every year Android smartphone manufacturers attempt to best their creation from the previous year with their latest flagship smartphone. The past year may have been a swing and a miss for the South-Korean tech giant, but their 2017 flagship – the Samsung Galaxy S8 is surely a hit out of the park in more ways than one. The massive QHD display which even thinner at the bezels this time around, and the hardware is powerful enough to get you all excited. However, all of this brand new bling might just be outshined by some of the minor quirks you may encounter when getting to know the Galaxy S8 better. 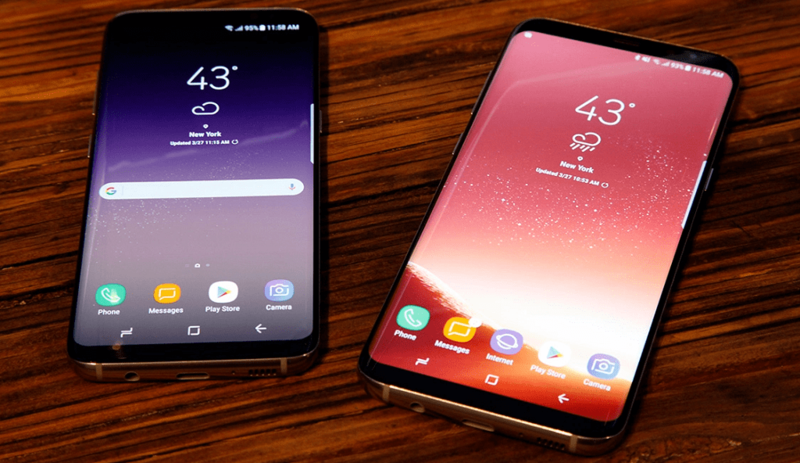 As amazing as the Samsung Galaxy S8 and S8 Plus are, you might just come across some minor bugs or common problems that thousands of other new users have. While your latest smartphone won’t go up in flames (we’re looking at you Galaxy Note 7), here are some of the most common problems on Samsung Galaxy S8 and a guide to fix them. Although a 3000 – 3500mAh capacity battery on a modern Android smartphone is decent by any standard, you’ll always find yourself hungry for more screen-on time. However, if you find your Galaxy S8 running on empty before the end of the day, there are a few tweaks you can make to squeeze out an hour or two of battery life. Samsung has included the Power saving mode for just this reason, which you can access easily from the Settings app under “Device maintenance”. 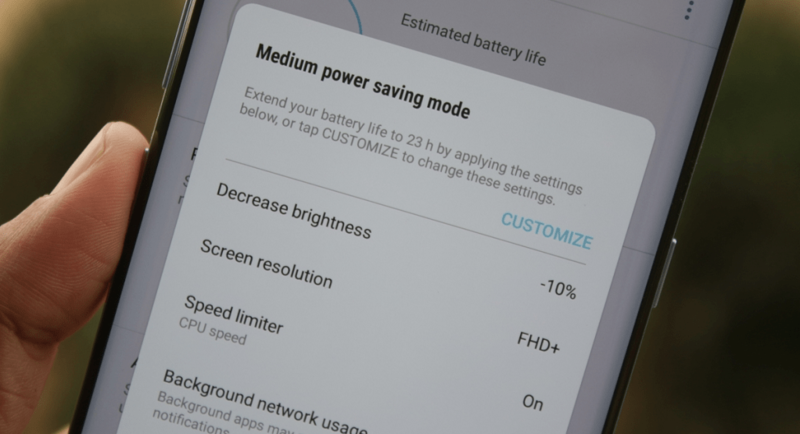 While the power saving mode is completely customizable, you can select the “Medium power saving mode” to reduce the brightness, set down the screen resolution FHD+, clock down the CPU and reduce background network usage. You might be losing an hour of extra battery life because of some shoddy app that you installed from the Play Store. Head over to the “Settings->Device maintenance->Battery usage” and find out if you have any battery-intensive app installed. Always On Display is definitely a great feature on the Galaxy devices, and while it may not hemorrhage your battery life, it still saves you hours if you do turn it off. Head over to the Settings and disable the Always On Display toggle switch from “Lock screen and security”. If you’re a tech nerd, then you probably already know that there was a viral story on the Samsung Galaxy S8 just after its official release. Several first-hand users from South Korea and even on the XDA Developers forum reported a significantly noticeable red tint on the display, which didn’t seem to be related to any particular app. 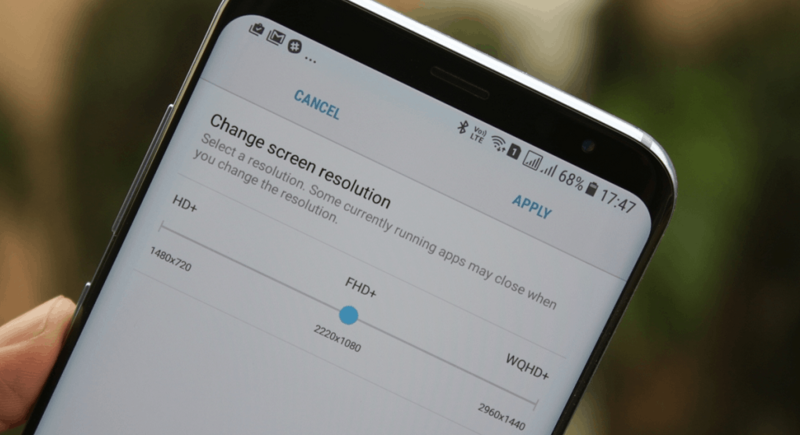 Samsung has already released a software update that should tune the color calibration of the display automatically and fix the issue on affected devices. Head over to “Settings->Software update” and make sure that you have all the latest updates installed on your device. Since this issue is related to color calibration, you can manually fix it by heading over to “Settings->Display->Screen mode. You can either choose the preset options -Adaptive display, AMOLED photo, and Basic, or choose the Color balance option to manually tune the RGB color balance of the display screen. If none of the above methods help you fix the red tint issue on your Galaxy S8, the last resort is a factory reset. If the issue still persists and the red tint on the display does not seem to go away, you can take your device to the Samsung store and ask for a replacement. One of the biggest dimensional changes that Samsung made to its latest flagship is by removing the iconic physical home button key, which also doubled up as the fingerprint scanner. While the fingerprint scanner has been moved to the rear side, many users find its positioning right next to the camera to be a bit awry. Start off by re-adding your fingerprint to your Samsung Galaxy S8 device to ensure that it unlocks every time. There’s a good chance that you could’ve been hasty when setting up the fingerprint during the boot-up, so you might need to reposition and add your fingerprint again by heading over to Settings-> Lock screen and security-> Add fingerprint”. Since the Galaxy S8 comes with an even better security mechanism in the form of the iris scanner, it could well replace the fingerprint scanner for good. You can set up iris scanning from the “Lock screen and security” settings and unlock your device by simply looking at it, which makes the unlocking process significantly faster. 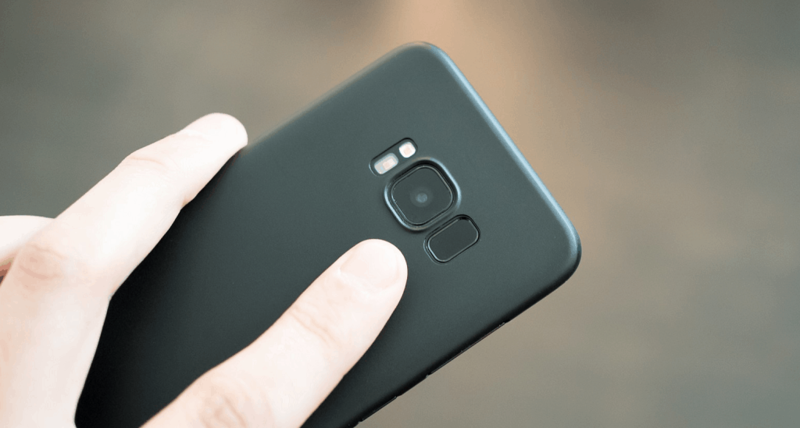 While putting on a case on your Samsung Galaxy S8 is primarily for protection, it can also help you get used to the new position of the fingerprint sensor. The physical separation between the camera lens and space where the fingerprint scanner is located will help you differentiate between the two with ease. There have also been dozens of reports from early Samsung Galaxy S8 and S8 Plus users who are facing issues regarding random reboots. 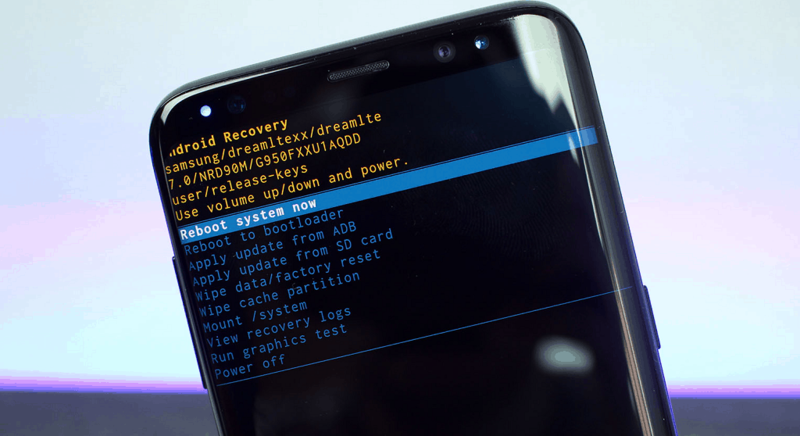 As stated by several users on the Samsung forum, the device reboots multiple times during a day, regardless of what app is being used and whether the phone is charging or not. As is the case with most major issues on Android devices, this could be related to the software. Start off by heading over to “Settings->Software Update” and install any pending software update that may be available for your Galaxy S8. If the software update does not fix the issue, you can start off by wiping your cache partition. Turn off your Galaxy S8 and S8 Plus, press and hold the Volume Up and Bixby button, and then press and hold the Power button. You should be able to see the Android recovery menu, at which point you can let go of the buttons. Use the Volume keys to navigate and select “wipe cache partition” and press the Power button to select it. You can try booting the device into safe mode to test whether it is an app that is causing the issue. Shut down your Galaxy S8, press the Power button until you see the Samsung logo pop up, at which point you can let go of the Power button and hold down the Volume Down button. The device will now boot into safe mode without third-party apps, so you can test out if the problem still persists. 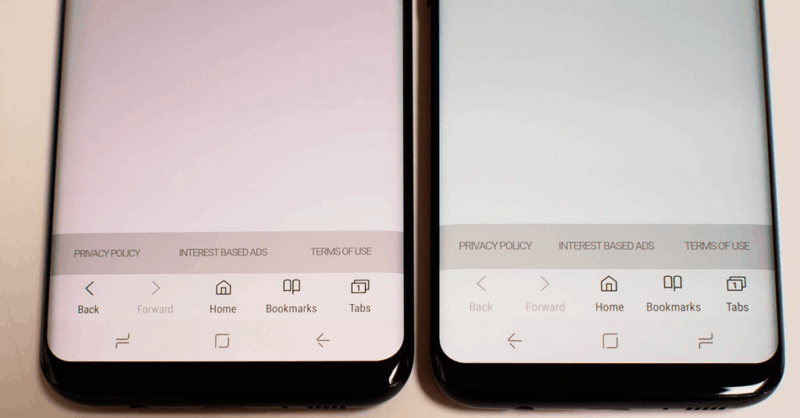 Apart from the Always On Display, Samsung Galaxy S8 users love the Edge lighting notifications too, and its absence has been noticed by many. The XDA Developers forum is crowded by users looking for an answer to why the Edge lighting notifications don’t glow up. Make sure that the Edge lighting notifications are enabled by heading to Settings->Display->Edge Screen-> Edge lighting and make sure it marked as “Always. Tap on “Manage Notifications” and make sure that the app you want to get the Edge lighting notifications from is on the list and toggled on. If you cannot find your desired app on the list of the apps that can be toggled with Edge lighting notifications, it simply means that the feature isn’t supported for that particular app just yet. Since there is only so much room for larger batteries, there’s a whole lot of system-wide features that are integrated into Android and Samsung to make each charge last longer. 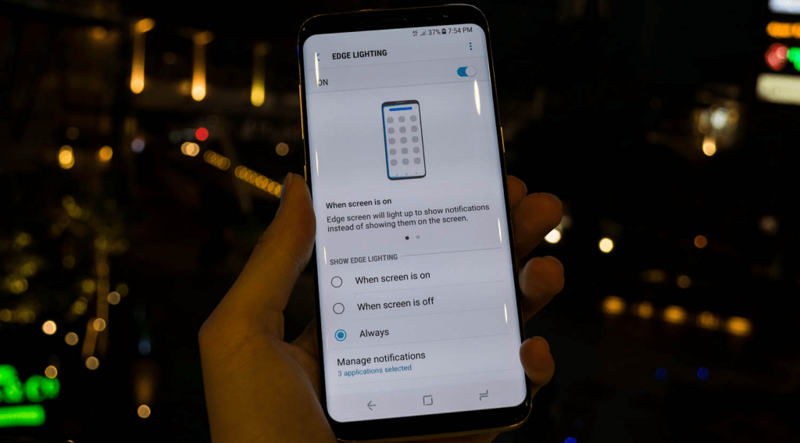 However, delayed notifications are sometimes the collateral damage of having delayed notifications, which has affected several users as reported on Samsung forums. If you have Samsung’s power saver mode enabled at all times, it affects the app performance when the CPU is underclocked and network usage is restricted. You can head over to Settings app under “Device maintenance” to either disable the power saver mode completely or customize it to grant network access to apps. Since some aggressive power saving features are built into Android 7.0 Nougat itself, the Doze-Mode could be the culprit. Go to Settings and search for “Optimize Battery Usage”, using the drop-down menu select “Change To” and add the apps from which want notifications to be delivered without any delay. After hearing all about how crisp and fluidic the WQHD+ display of the Samsung Galaxy S8 and S8 Plus is, you might be slightly disappointed to see that you don’t get the desired 2960 x 1440 pixel count right out of the box. Designed to be a battery-saving precaution by Samsung, the resolution is set by default ay Full-HD, but you can change that easily. To get that magnificent quad-HD display rolling on your Galaxy S8, head over to the Settings app navigate to “Display-> Screen Resolution”. You’ll be able to see that the slider bar is set to FHD+ by default, so move it over to the right towards WQHD+ to max out the resolution. However, remember that Samsung has the FHD+ resolution set as default for a reason, so your battery life may take quite a hit if you choose to keep WQHD+ as the default resolution. Connectivity issues can be a cause for trouble on any Android device, and the Samsung Galaxy S8 and S8 Plus are no exceptions. Users have reported poor Wi-Fi connectivity and lackluster Bluetooth sound playback since the early days of release. If the updates haven’t fixed these issues for you, there are a few tried and tested troubleshooting methods you can try out. Simply turn off your Wi-Fi and Bluetooth toggle and turn it back on after a minute or two, or head to the next step is the issues persist. A quick reboot can also help reset the connectivity drivers and modules, so try it out if your Wi-Fi and Bluetooth continue to falter. If your Wi-Fi issues still persist, head over to the Wi-Fi settings, tap on the network name you’re connected to and select “Forget network”. Now tap on the network again, enter your password and connect to the network to re-establish the connection. The same method can be used for faltering Bluetooth connections. Simply head over to Bluetooth settings, unpair the device and establish a new connection by entering pairing mode. If the connectivity problems continue, you can refresh all the network settings at once. Head over to Settings->General management->Reset and select “Reset network settings” to give your Galaxy S8 a connectivity refresh. To its credit, Samsung has improved the user interface and design of the TouchWiz UI on the Galaxy S8 significantly. The absence of an app drawer button or your love for Google’s barebone UI may attract to you to the Google Launcher, but you’ll have no luck making it work on your smartphone the right way. Galaxy S8 users on XDA Developers forum have reported this issue, which apparently is caused by the Secure Folder app. You can have Google Launcher working on your device if you choose to disable and uninstall Secure Folder. Since it could be a feature that you regularly use, your best bet is choosing a third-party app such as Nova to replace TouchWiz on your Galaxy S8 and S8 Plus. Most of the common problems pertaining the Samsung Galaxy S8 and S8 Plus are software related and can be fixed with Samsung updates and a factory reset every now and then. However, if wouldn’t be outlandish to consider manufacturing defects with your device, no matter how rare it may seem. Be sure to reach out to Samsung customer care, your network carrier or the retailer you purchased your device from in case things take a turn for the worse. Are you among the users of the brand new Galaxy S8 and S8 Plus who has faced any of the issues mentioned above? If you are in search of a common problem that you can’t seem to find a solution anywhere, head over to the Updato Forum and create a thread. Our band of Android geeks will be glad to help you fix the issue and get you going.